Description: Like Huntsman's iconic silhouette, the Airstream represents an incomparable mix of heritage and modern design. This original 1980s Airstream RV has received the full Huntsman bespoke treatment, thanks to a careful restoration undertaken by Timeless Travel in Colorado, US. The exterior, sheltered by a Huntsman claret awning, features a bespoke tweed vinyl stripe originally developed for interior designer Robert Couturier. The interior features Huntsman’s tweed homage to Gregory Peck, as well as a selection of bespoke tweeds created in collaboration with Huntsman enthusiasts Picasso scholar John Richardson, architect Leo Daly, and American Vogue's editor-at-large Hamish Bowles. 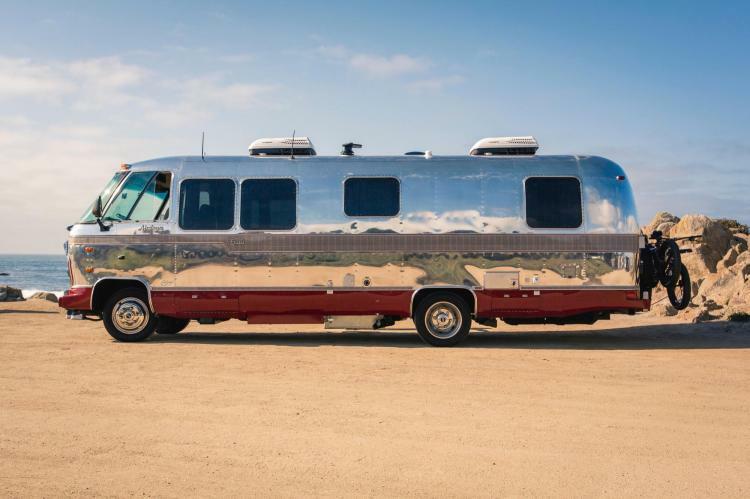 The Huntsman Airstream has already made its mark on the American landscape, from Pebble Beach Concours d' Elegance to Burning Man (see the Airstream in action here https://drive.google.com/file/d/1LeCd_MOD7CGoOaiTpm2r9kzLW-Sgl6VM/view?usp=sharing), and the winner of this lot can be part of its road tripping history. The Airstream, which is operated by Timeless Travel, will be brought to the buyer and up to three guests in their choice of Colorado, New Mexico, Utah, Nevada or California for a week of pleasure. - Timeless Travel to bring the Airstream to the buyer in their choice of one of five US states: Colorado, New Mexico, Utah, Nevada or California. Buyer must have a truck driving license admissible in the United States, proof of which will be required before undertaking the experience. Alternatively a driver can be arranged at extra cost.